A new alternative to the ''beanbag'' from the past. 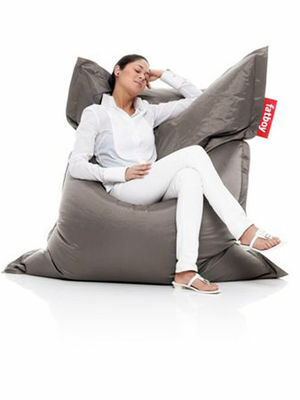 Jukka Setälä from Finland designed the Fatboy Original in 1998 as the beanbag from the 21st century ! A Fatboy deserves a place in every living- and bedroom. It has a multitude of uses : a lounge bag for a student's room, a relaxing option for the office, a comforting-pillow for children, or even, a spare bed for unexpected guests. The Fatboy Original is made of a practical and easy to clean nylon material with a special coating, a rub with a damp cloth is sufficient to keep it looking new. The Fatboy nylon is also water-resistant, ventilated and non-fire coated. Outdoor and indoor use. Fatboy Original is available in various colours and in a special series with Marimekko textiles.